Very nice farmland/pasture combo ranch in a strong farming community. Approximately 38 acre hay meadow and 90 acre pasture that&apos;s currently leased for grazing. The remaining 228 acres is leased for cultivation. Grazing land is fenced for cattle and includes holding pen. 3 ponds provide good surface water. 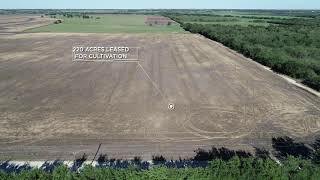 Acreage provides potential homesite locations to develop this into a family farm and ranch property. From the town of Birome, go South on FM 308 for 2.5 miles. Turn left onto County Line Road. Property starts immediately on the left.